Synagogue, now the public library, in Baja. ...From Janoshalma I catch the train to Baja. 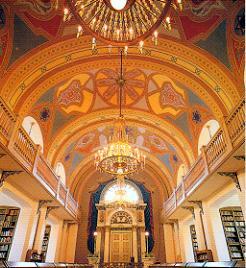 Once in town I stop at a kiosk and see a postcard of the interior of the synagogue for sale. I point to the picture and ask the proprietor where the building is. He points grumpily and vaguely down the street behind him. Following this half-hearted clue and hoping it’s not a red herring, I head in that direction. After walking back and forth a couple streets, and returning in the direction of the centre, I see high walls, and above it the classical style roof with Hebrew inscription: the town’s library, and formerly, when a Jewish community existed here, the town’s synagogue. Beyond the walls is a large courtyard, the imposing temple to the left, long steps with pillars, the entrance opening on a dark lobby, and then into the schul, a gloriously coloured arched ceiling soaring above. On either side of the building beneath the generous galleries are white alcoves lined with inset wooden bookshelves, illuminated by large windows. The colours are breathtaking, and so new. It underwent a thorough restoration in 1985, to its original condition, apart from the changed usage. 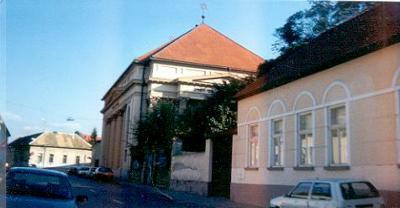 The synagogue is in neo-classical style, designed in the mid 1800s by Karoly Gerster and Lajos Frey. The pillared Aron ha Kodesh, a semi-circular window above it, still contains three old Torahs. Three heavy candle chandeliers hang down the main body of the hall, on either side of which are sloped reading tables. Outside, a long wall with roof, arched cloister-like supports and shaded benches, runs around half the length of the courtyard, and around the corner. In the centre is a Holocaust memorial listing the names of the 3000 or more Jews from the Baja area who were deported and died during the war. According to my guide book, in 1990 only twelve Jews remained in this large commercial town, the sole remnants of a community which settled here in about 1725, and which, in 1910, numbered some 20% of Baja’s entire population.